Grilled Chicken Shawarma with Garlic Yogurt – an easy, grilled chicken version of the classic Turkish street food which is usually cooked on a rotating spit. 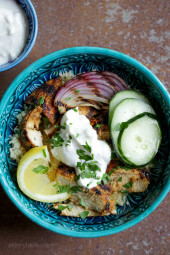 It’s perfect served over couscous with yogurt and cucumbers as I did here, or try it with rice pilaf, or on a pita. Other sides that would work are tomatoes, tahini, olives, feta, or hummus. Harissa would also work great to add some spice. Using grilled chicken makes this lighter on calories, but loaded with flavor! You can cook this outside on a gas grill or year round on a grill pan. 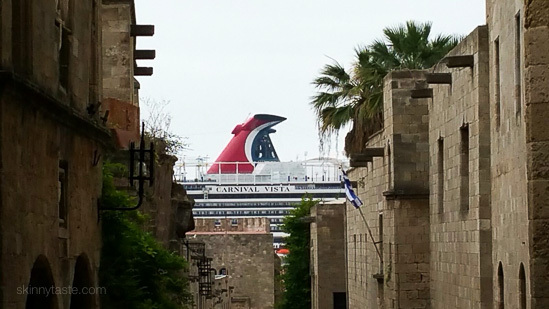 I just returning from an incredible 10-day cruise along the Mediterranean on the brand new Carnival Vista, which started in Barcelona and made stops in France, Italy, Turkey and Greece. Now that I’m back, all I’m craving is Mediterranean food! What an experience of a lifetime traveling to Rome, Pisa, Tuscany, Naples, Florence, Arles, Aix-en-Provence, Kusadasi, Crete, Rhodes and Athens with my family. 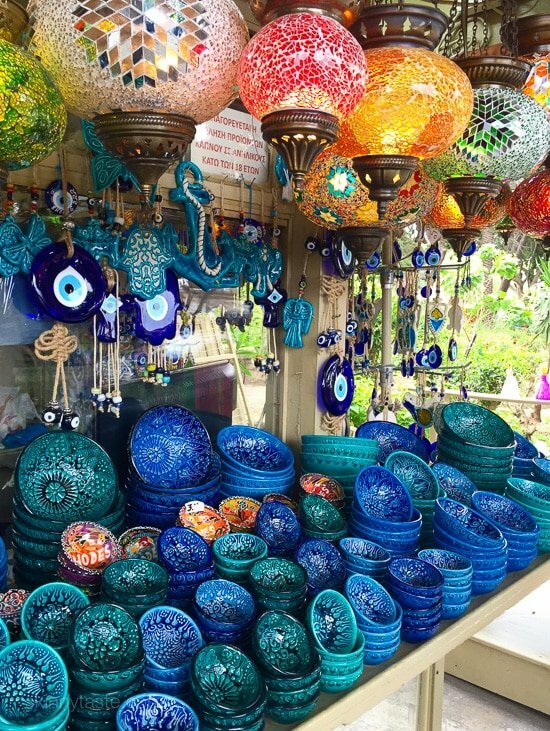 While in Rhodes, Greece I purchased these beautiful bowls which I later learned are from Turkey so I thought it would be fitting to share this Turkish inspired recipe and serve them in my beautiful new bowls. I was so inspired by the food, I plan on sharing plenty more recipes from my travels. 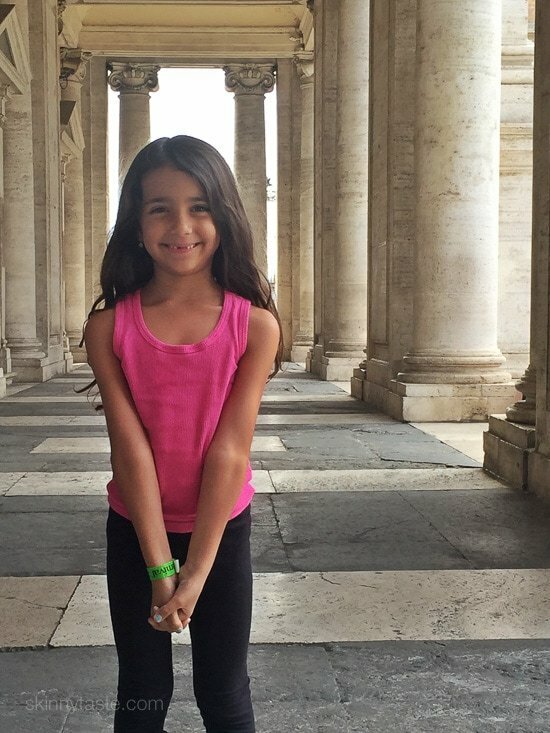 If you have young kids and think it’s hard traveling through Europe with little ones, my 6-year old did great keeping up with us! On the days she was too tired and didn’t want to come along on the excursions (Greece and Turkey) she stayed on board at the kids camp which she LOVED! She made new friends and even cried when it was time to come home :). 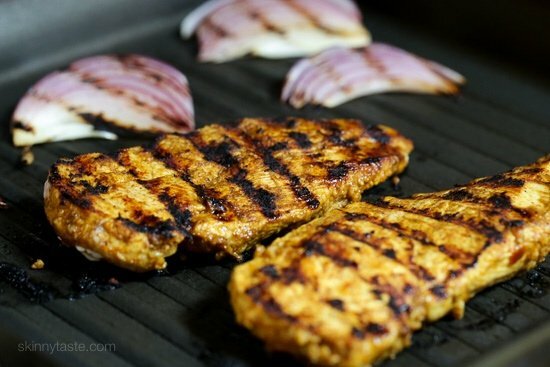 An easy, grilled chicken version of the classic Turkish street food which is usually cooked on a rotating spit. It is perfect served over couscous with yogurt and cucumbers as I did here, or try it with rice pilaf, or on a pita. Place the chicken breasts, 1 at a time, in a Ziploc bag. Pound each breast to an even thickness, about ½-inch thick, being careful not to puncture the bag. Place pounded chicken breasts back into bag and set aside. In a medium bowl, combine olive oil and lemon juice. Whisk until combined. Add the garlic, cumin, paprika, turmeric, curry powder, cinnamon, red pepper, salt and black pepper and whisk again. Pour the marinade into the bag with the chicken, massaging it to evenly coat. 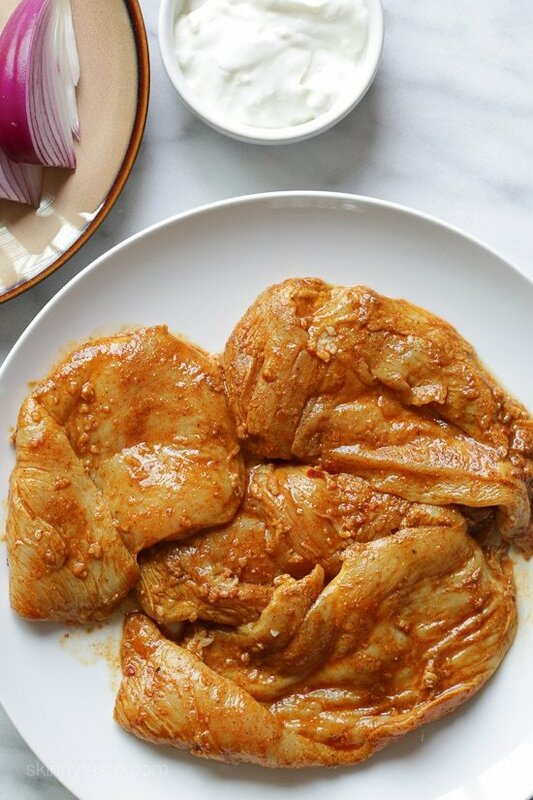 Refrigerate and marinate for at least 1 hour, up to overnight. In a small bowl (or right in the container), combine the yogurt, garlic, lemon juice and salt. Stir to combine and refrigerate until ready to use. Over medium-high heat, grill the chicken for 3 minutes or until it no longer sticks to the grill. Turn the chicken and grill an additional 3-4 minutes. Allow the chicken to rest for 5 minutes then slice it thinly, across the grain. Top each breast with 2 tablespoons sauce and a sprinkle of parsley. Serve.